Use predefined or create custom filters – any complexity, really. 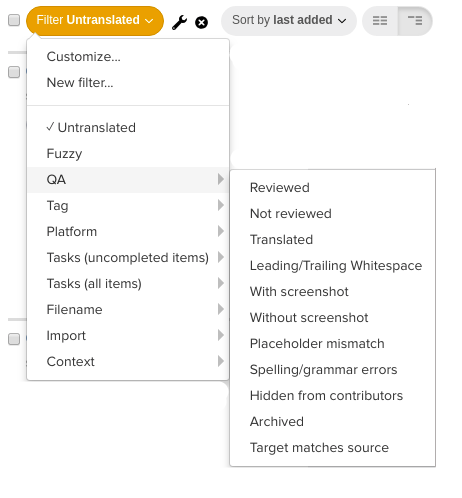 Use Filter while editing translations in Lokalise in order to show only the desired strings or keys, for example you can filter only untranslated strings, that belong to iOS. There are some predefined filters you can choose from or you can create a custom filter (select New filter...) in the filter drop-down. You can even customize any of the pre-defined filters and save them under new name. Add as many properties and conditions as you like, group them using AND / OR statements, then click Save and apply... to save the filter. Filters you save are shared between all project users.